ROSEMÈRE, November20, 2018 – The Town of Rosemère is proud to announce the name of the winner of the Ride, Walk, Run– The Library’s Fun! 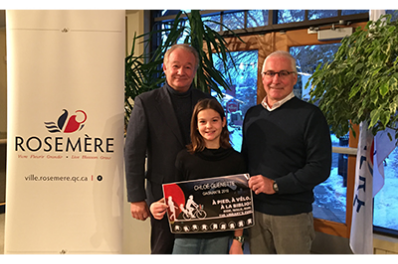 Program: 10-year-old Rosemère resident Chloé Guénette, who has been awarded a $500 gift card from Sports Experts Rosemère ($250) and the Town($250). The new one-of-a-kind program was launched this spring, on April9, to raise residents’ awareness of the importance of adopting healthy lifestyle habits and incorporating them into their trips to the library. The concept was simple: residents could obtain a Ride, Walk, Run– The Library’s Fun! card at the library and get it punched at the circulation desk every time they travelled there by foot or by bicycle. Every card punched nine times was then entered into a draw for the grand prize. “We are pleased to see that the program succeeded in encouraging library users of all ages to embrace healthier living. Thank you to everyone who took part!” said Mayor Eric Westram.